Thank you for your interest in this elegant and time tested art form. We look forward to providing you with creative guidance on your project. If you have any questions after you submit this, please feel free to email us at: info@farmwoodpress.com. 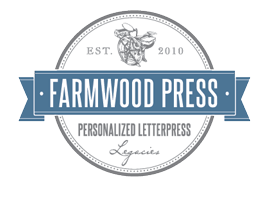 Farmwood Press :: Thank You! Thank you for contacting Farmwood Press! We'll get back to you as soon as we can. We look forward to speaking with you! Return to the Farmwood Press website.